Tindaloo in CyberSpace: We're All MAD here!!! Har lagd nok et kort med motiv hentet fra eventyrene ~ Alice i eventyrland ♥ Denne versjonen krysser Alice med Hattemakeren, og kake og te-selskapet! Et helt fantastisk motiv fra SSD. That is one of my fave quotes! And book n movies! Got a cheshire cat tee with the sentiment on it ~ it fits perfectly for any crafter I think ;) We're kindof like Alice falling into the wonderful crafting world.. or the Mad Hatter in a mix & match colors n stuff .. and somewhat hoarder mentality... A crafter is a bit like the Red Queen too, in that we'll chop off anyones head that dare touch or throw out our precious stuff... And very much like the very late bunny, I never seem to be on time for anything ~ sooo many projects!!! 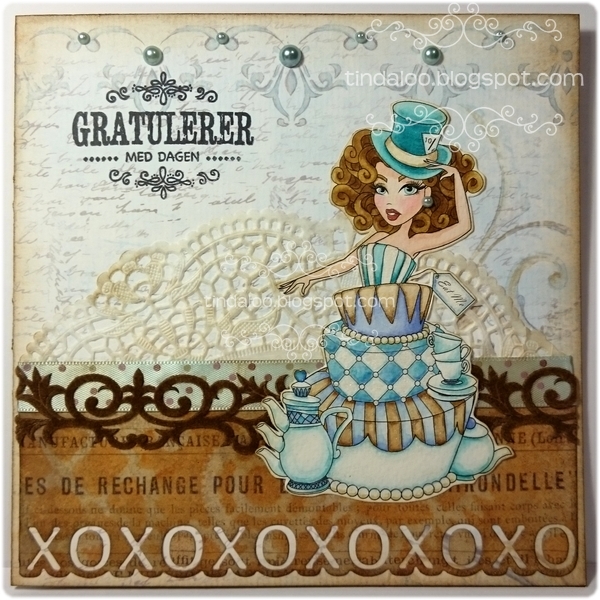 Stamps/Images: Sassy Studio Design digi stamp 'Buttercream Babe - Mad Hatter'. Lazar StudioWERX Inc rubberstamp 'Funky Holidays' (swirl). Kort og Godt CS (text stamp) 'M-259'. Papers: Bazzill cardstock. Plain white cardstock. Panduro Hobby PaperPad '..'. 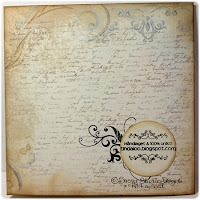 Tim Holtz Idea-ology Paperstash 'Crowded Attic'. Embellishments/Tools: Whiff of Joy 'XOXO' Border Die. Spellbinders™ Nestabilities 'Labels One s4161'. EK Success® Whale Of A Punch 'Large Circle 1.75'. 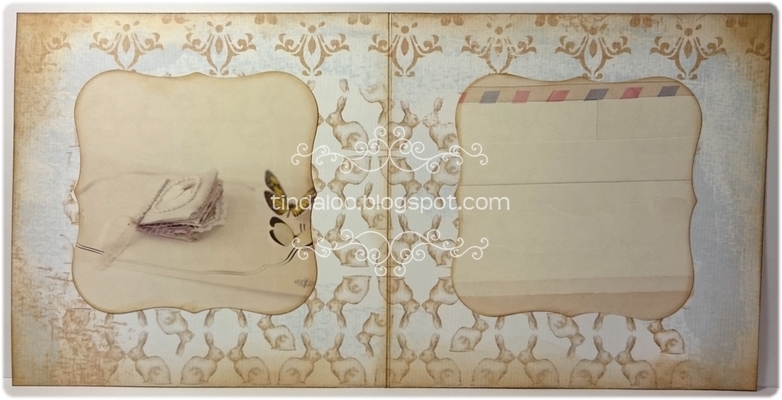 Panduro velvet ribbon & bling ~ Scrapbook Mem. 'teal' half pearls. Aha! Designs CraftLover sticky ribbon 'Fancy'. Paper-Design Doily. Techniques: I always use my Scor-Pal to score n fold my cards. I prefer Canson Montvale aquarelle paper (200 g/m coldpressed). My distress tools from Ranger Ink is always in use! ~ Tim Holtz® Mini Ink Round Blending Tool & the Inkssentials Ink Blending Tool and Foams. I used misc. Luminarte Twinkling H2o's Shimmering Watercolors, and Tim Holtz Distress Ink pads & markers to watercolor and distress image and papers, and DI spray stains through unknown 'Gears' stencil. This is a beautiful project with wonderful attention to detail and perfect for our 18th ‘ANYTHING GOES’ challenge. Thanks for sharing your talent with us. Good luck.